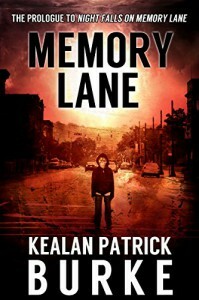 A standalone prequel to a new series, this short read details the beginnings of a town affected by amnesia. Glenn is a resident of Kincaid, his life is slipping out of control a little as he is passed over for promotion and has had no luck getting a second job to maintain his family's financial security. He begins to feel that something is off in Kincaid as he encounters acquaintances and neighbours who don't seem to know who he is. As he begins to experience headaches and sees shadows, he fears he too if affected by the strange happenings in the town. This packs a lot into just over 20 pages, the character of Glenn is really well fleshed out for such a short read and as with most of KPB's work the prose is engaging and flows beautifully. Although the end doesn't have any resolution it is quite chilling and a great way to end the story. I'm not sure what's happening with the series, nothing appears to be out yet but this let's hope it comes out soon.